who robbed Tower Theaters at the Village Commons Monday afternoon. by dialing (413) 538-8231 and pressing 6. SOUTH HADLEY – Police are seeking the identity of a female individual who robbed Tower Theaters this past Monday afternoon. According to South Hadley Police Lt. Steven Parentela, a young female entered the Village Commons movie theater lobby at 4:09 p.m. on the afternoon of April 30. After seeing the front desk left unattended, the female walked behind the counter housing the cash registers and removed approximately $100 from the drawer before she was caught by an employee entering the lobby from the opposite side of the theater. The female darted from the theater with the male employee in pursuit. As they both ran down the adjacent spiral stairwell, the male employee was able to recover the stolen money as the female threw it at him while descending the stairs. She then exited the stairwell on the ground floor in an unknown direction of travel. 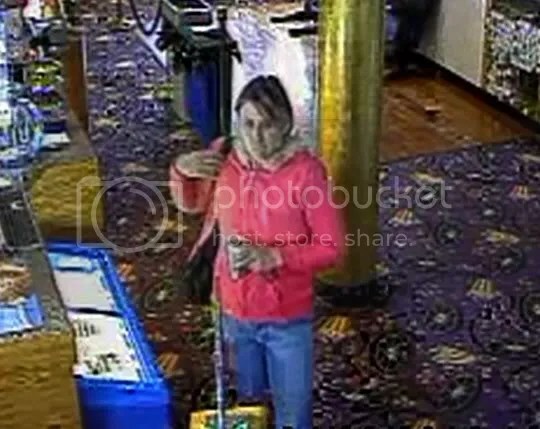 After reviewing Tower Theaters’ security footage, police were able to get a good look at the female thief. South Hadley Police describe the girl as having dark hair with blonde streaks, wearing a pink hooded jacket and blue jeans. She was carrying a pink and black Nike drawstring bag at the time of the robbery. Parentela said his department initially believed the incident to be a crime of opportunity. Now they believe the female suspect may have been looking for empty offices and businesses in the Village Commons from which to steal items. A short time after the incident occurred on Monday, police received a report from an individual who works at the Village Commons believing his wallet had been taken from a jacket pocket left in his office that day. Police are asking if anyone knows or recognizes the suspect in the photo to please come forward. An anonymous tip line at the South Hadley Police Station can be reached by dialing (413) 538-8231 and pressing 6.
at 4:09 p.m. Monday afternoon and stole $100 from the cash register. Call the South Hadley Police Station at 538-8231.